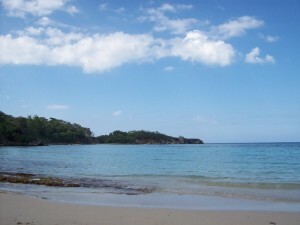 Winifred Beach is not the easiest spot to find but it is well worth the effort. It requires keeping a sharp eye out when travelling east out of Port Antonia to take the correct left turn that will take you into a housing area. After that with a little more faith that you are going in the right direction you will take a very rough (understatement) road going downhill, for a while the vegetation blocks any view of the sought after shore line, leaving you to ask the first person you see, if this is indeed the beach. However, it looks like a line may be drawn in the sand both physically and metaphorically. There is a fight on in regards to the future of the beach. Over simply put, on one side those who want to keep the beach free and on the other the Urban Development Corporation which wants to develop it. The UDC Website says that Winifred beach is part of the Fairy Hill property in Portland that the UDC got in 1976. The UDC says a plan to include public beach, agriculture land, site and services and community space has been created and the organization is looking at phased development for the beach. According to Jamaica Information Service in 2004 the UDC announced plans to upgrade the Winifred public beach in Fairy Hill Portland. The Free Winifred Beach group points to the Beaches act it says states that if the beach is not owned uninterrupted for twenty years it cannot be privatized the organization is asking for help to raise the money to make the case and keep the beach free. The issue may end up on the back burner for a while, overshadowed by the concerns raised by the Office of the Contractor General, over UDC operations, and an investigation into the agency that’s been ordered by the board. and a chance for people to experience the beach as it is for a little while longer. A Tale of Two Executions. It may be a particularly morbid irony that this last September two executions of note took place on the same day. One perhaps, for what it was worth with more press than the other, that of Troy Davies a death row prisoner in the U.S. state of Georgia, convicted of the murder of an off duty Police Officer Mark McPhail in 1989. Davies said he was innocent… and whilst there is a saying that prisons are full of innocent people we could perhaps concede that some of them may indeed be innocent. Supporters of Davies drew attention to the fact that 7 out of 9 witnesses changed their original opinions and other issues to suggest that his guilty verdict was unsafe. However prosecutors stood by their case and despite the legal wrangling over the years the execution was carried out. Davies maintained his innocence to the end, perhaps holding to the hope that a history he would not be part of in person, would absolve him, and someday he might be remembered as an innocent man wronged by the system. Representatives of the family of Mark McPhail spoke of their belief that the execution meant that justice had been done and they should not be faulted for that, they must take what comfort they can, but there can hardly be much, when one loses a loved one to a violent and unexpected death. Could we claim to think so differently had we been in their place over the decades? But I began by saying, a tale of two executions; the other one on the same day in Texas was of one of the men found guilty of the dragging murder of James Byrd Jr., on June 7 1998. His name was Lawrence Brewer a man convicted of a shockingly modern racially based crime. James Byrd was black and that was why he was chained to the back of a truck and dragged along behind it conscious during the ordeal until death came when his head struck a culvert. One of the things remarked on in the reporting of the execution of Brewer was that he had requested a last meal and refused to eat it. As reported in the press that has led to an end to the practice of offering the condemned man a last meal in Texas. It all seems a little out of place in a story about killings and executions but it is there. An execution is final whatever new evidence or rehashing of the case may find the condemned man remains dead and only history is righted. Those who champion the cause of an end to the death penalty also have to face the fact that their efforts, if successful will benefit the innocent and the guilty.